UNE Discovery | Taking science to the streets! 29 Nov Taking science to the streets! In October this year, UNE Discovery joined forces with the Australian Museum to bring science to life in Tamworth! 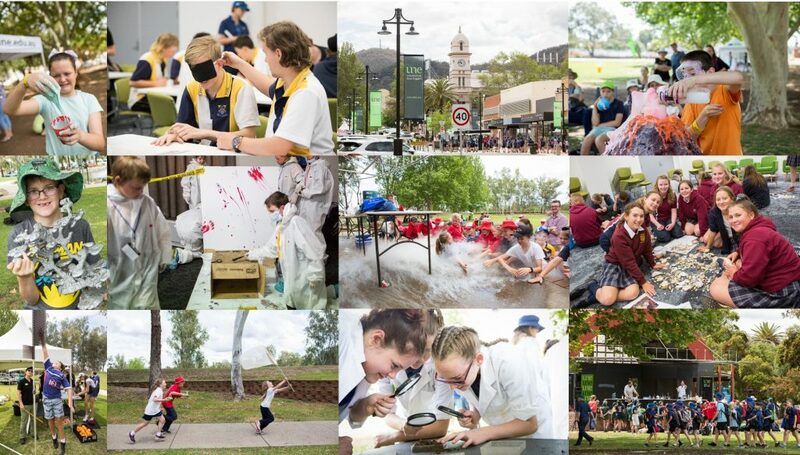 Science on the Road was a 3-day extravaganza, with Scientists from UNE and the Australian Museum (AM) taking to the streets of Tamworth to bring hands-on interactive science experiences to children (young and old!) of the New England region. Over the three days, we took over Fitzroy St in Tamworth, with activities buzzing across Tamworth Town Hall, UNE’s Tamworth campus, Fitzroy St Mall and Bicentennial Park. The first two days involved workshops that school groups could book into, which saw over 500 students taking part in interactive and immersive science experiences. On the third day, we opened up the event to the public for all to enjoy, and welcomed over 600 people into Bicentennial Park! We couldn’t have done all of this without the wonderful team at ANZ Tamworth, Tamworth Council, TRECC and the UNE Tamworth Centre. Thanks also to UNE’s Marketing and Promotions Team for donating our Scavenger Hunt Prize of a signed NSW Blues Jersey! This was a hugely successful event, and we’ve had many attendees asking for more like it! It really is hands on and interactive experiences like these that have a deep impact on students. Experiential learning, and exploratory activities not only show them the possibilities, the variety and the exciting knowledge to be gained from having a curiosity about the world around them – but by doing science,they demonstrate to themselves that anyone can be a scientist – there’s something in it for everybody!